THE first female chief executive officer in a homegrown bank could come from DBS. The bank's current CEO, Piyush Gupta, when asked yesterday at a women's networking event whether the his successor could be a woman, replied: "The next CEO could definitely be a woman. In my succession plan, we definitely have women on it." Three women now sit on DBS's executive committee - head of institutional banking group Jeanette Wong, head of consumer banking and wealth management Tan Su Shan and chief financial officer Chng Sok Hui. The trio make up a third of the nine-person committee. 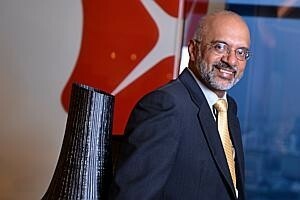 Mr Gupta said: "All of the most powerful functions in DBS are run by women. So when people ask me these days why the results are so good, I say 'My job is to look pretty'." By comparison, OCBC and UOB have just one woman each in an equivalent committee. Standard Chartered Bank lays claim to being the first large bank here to appoint a woman as CEO of its Singapore operations. In 1994, Theresa Foo assumed the top position there. She was succeeded by another woman, Euleen Goh, who has had an illustrious career in banking. Ms Goh is also a board member of DBS. Mr Gupta said in his speech that having both genders represented was a form of diversity, but because the female workforce has not been well tapped, the chances of finding a good candidate among women are better. "If you want to go fishing, you want to go fishing in a pond that is not understocked," he said. To support women as they start families, DBS has allowed them to take sabbaticals, he added. Referring to Facebook chief operating officer Sheryl Sandberg's book Lean In, which urged women to step up to the plate to take risks, and ignited a debate about gender equality, Mr Gupta said the notion of "leaning in" applies to both genders. "I honestly believe that a lot of women like to take shelter in the notion that 'our gender is like that, and that's why we're not taking initiative'." He also suggested that the benefit of an old boys' club has been overplayed: "People think there's an old boys' network. They get together to get drunk, and that's how they get jobs. "I've never done that. Networking is really about figuring out the important people who are going to be relevant to you, and making sure that you can engage with those people."